The dodo was a flightless bird related to doves and pigeons (sharing an order with them, Columbidae) that was native to the island of Mauritius in the Indian Ocean. 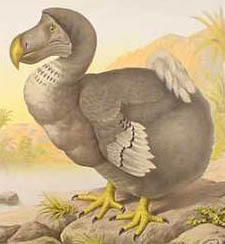 The dodo became extinct almost certainly due to over-hunting by the humans who arrived on the island. The dodo is famous for its reputation for being stupid. However, because it was at the top of the food chain in its own little ecosystem, it had no natural predators and thus, had no reason to fear other creatures (such as the humans who discovered the island). It wasn't stupidity that caused the downfall of the dodos, it was ignorance. Surprisingly, for such a famous bird, little is known of its appearance or behaviors; by the time scientists became interested, it was already extinct, a testament to the destructive power of our species. The dodo has become a byword for any creature that is doomed because it can't adapt to its environment, which is in contrast to its distant and still-living relative, the Rock Pigeon, which has adapted and benefited extremely well from human exploitation (and being hated by humans for its success) — it went from being a European cliff-dwelling bird to a bird with very, very large populations on every continent except Antarctica. ↑ Rock Pigeons: Rats with Wings or Thoroughbreds of the Air? This page was last modified on 4 May 2018, at 02:42.